Presuming your parrot has a place to bathe, there should be little need for you to help him preen. He can take care of his own feathers, thank you. Instead, “grooming” a parrot means maintaining his nails, beak and wing feathers (which re-grow and should be trimmed two or three times yearly). For that, he needs help. Your bird requires professional grooming at least a couple of times a year. After a few visits and a little training, a careful owner can usually learn to maintain his bird’s wings, nails and, very occasionally, beaks. Each bird’s grooming needs must be suited to his disposition. A groomer usually knows what a particular bird needs, but if you have a preference as to how the wings should be cut, talk to the groomer before he or she starts trimming. Feathers should be trimmed enough to restrict – but not completely prevent – flight. Don’t forget that even radically trimmed birds can be blown away by a gust of wind, and they need some ability to fly if that happens. Grooming requires toweling, so your bird must learn to love – not fear – the towel. He must be conditioned to relax during future grooming and veterinary evaluations, so ask your veterinarian for suggestions as to how to get him used to a towel. Nobody wants to find his or her bird injured. While some accidents can be prevented only with forethought, a wing trim is the primary means of keeping indoor parrots out of trouble. Wings should be trimmed symmetrically, using the least invasive trim possible. Only primary flight feathers should be trimmed, for only primaries enable altitude; the other wing feathers are for protection, maneuverability or braking. A minimal trim must be frequently maintained, as the bird can regain flight with only one long new feather. Don’t expect to take your bird outdoors without a cage. Even a severely trimmed, pudgy Amazon can be blown away on a very windy day. If a pet bird’s wing feathers are untrimmed, it must be trained to fly dependably to humans upon request. Only harnessed birds should be allowed outdoors outside of a cage. If your bird flies away, go after him. Most sensitive, cautious, inexperienced or poor-flying birds require only minimal wing trims. One-half to two-thirds of feather length outside the coverts of the six end flight feathers should be trimmed. This trim protects new feathers as they grow and ensures maneuverability to the floor in case of a fall. Many accomplished flyers can barely be grounded. These birds must be trimmed shorter and more feathers must be trimmed. Trim all flight feathers about one-fourth to one-half inch outside the coverts. Baby birds should be allowed to have sharp toenails (so they won’t fall), but an adult parrot’s nails shouldn’t raise the ball under the end of the toe up off a flat surface. Some birds may be trained to allow a favorite person to file the tips off their toenails with an emery board. Tiny human nail clippers may be used on small birds. For birds the size of a quaker or larger, grind toenails with a cordless Dremel. Heat produced by the grinding stone cauterizes the blood supply, minimizing the risk of bleeding. If the bird does bleed, stop it with Qwik-Stop coagulating powder. 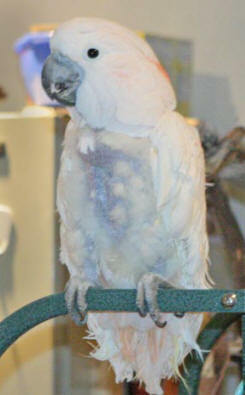 Most pet parrots require little or no beak maintenance. But occasional deformities worsen as the parrot gets older and require reshaping from time to time. While a very cooperative parrot may occasionally allow you to file his beak with an emery board, almost all beak grooming should be done by a professional. Whatever you do, don’t use a Dremel on small birds because the vibration of the tool could injure or kill it.